If a natural or manmade disaster happens, many people will be forced to bug out and relocate. But even if a disaster doesn’t happen, people move for education, adventure, or a better life all the time. Either way, a move from one type of environment to another can be a huge shift for the body and mind. And unfortunately, modern society spoils us with multiple conveniences like heating and air-conditioning. Because of this, most people don’t have the strong sense of will and perseverance needed to handle an extreme change in environment. The good news is: you can practice training your body and mind. 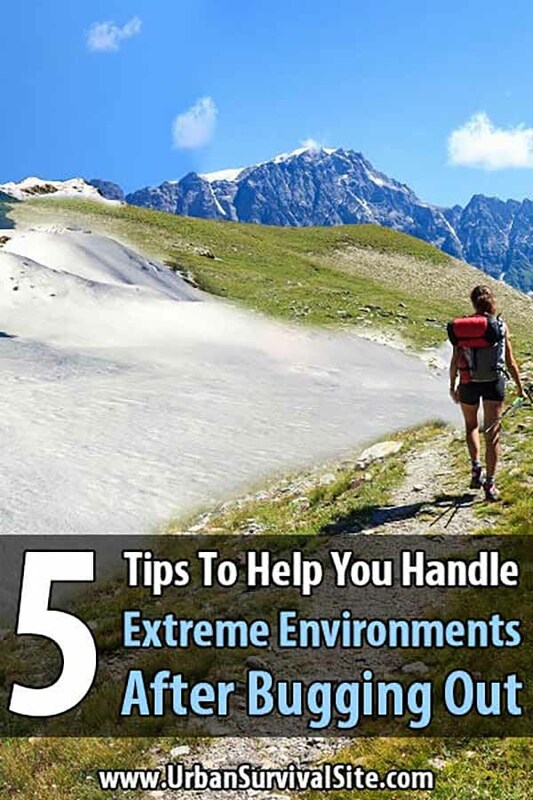 Here are 5 tips to help you handle extreme environments after bugging out. It’s about as bad as moving from Antarctica to the Sahara Desert, at least to you. You need to quickly get accustomed to the higher temperatures in order to survive. Light-colored and loose-fitting clothes are your allies in the transition. While layers are said to be breathable, it depends on the material and the conditions you are working under. If you have to wear layers of clothes for work, go with breathable cotton or other natural fiber. Know that it will take 10 to 14 days for your body to acclimate to the heat. Go slowly: Expose your body safely to the heat for two hours every day. Increase your daily activity from low intensity to high intensity gradually, doing slightly more exercise or work for longer periods each day. As you adjust to the heat, your body will be able to function more closely to its optimal level. Cardiovascular function improves within five days, and the body’s core temperature adjusts within the first eight days. Take regular, short breaks. Smaller, more frequent meals will help your belly feel like it’s not going to burst while breathing. Hydrate and alternate between sun and shade when necessary. Humans are most well-adjusted to tropical temperatures, but have survived within arctic temperatures. We can now adjust to cold through layers of clothes, blankets and shelter. With perseverance, time and mindfulness, anyone can acclimate to a cold environment. It’s vital to maintain body temperature. Proper clothing and shelter help the body maintain its temperature, but nutrition is the most important. The mind and body will adjust to its perception of what cold is compared to warmth in the new environment. That will happen over the course of weeks as the body eases its shiver response. Cold-weather athletes may train in temperatures around or below freezing for 10 or 20 hours a week. Long-distance swimmers and cultures that live in extremely cold temperatures show how the body can adapt by redistributing heat instead of a focus on fat as insulation. Think of the pearl divers in Korea, who dive into cold waters without a wetsuit. Think of explorers in Antarctica walking around in a T-shirt. H.R. Bowers is famous for a 1911 expedition to the South Pole, and others thought he was crazy for his preparation ritual of dumping buckets of ice water over his head, while naked. They ended up being the ones shivering at night, while he slept soundly. Repeated, safe exposure and time do the trick. It’s important to also educate yourself about health conditions that can occur in the cold, such as hypothermia and frostbite. Be prepared and have patience as you adjust to the cold. It doesn’t compare to driving eight hours to see your sister in another state. It’s important to know how to react when driving in extreme weather. This doesn’t compare to coming home and collapsing on the couch after an hour of Zumba. Your need for high physical endurance is greater than it’s ever been, whether you’re going to be hiking mountains, crossing deserts, or rowing a boat. Learn about your new environment, its climate, terrain and usual weather patterns. If you are climbing to a higher elevation, be prepared for altitude sickness. Watch for headaches, fatigue, dizzy spells and nausea. Consult your doctor for what to pack: Certain teas, ginger to chew upon, or ibuprofen will help with headache and nausea. Help your body adjust physically to travel and increased exercise. Depending on the distance of your travel, frequency and intensity of your journey are important factors to consider when adapting. As with any exercise, keep the frequency and intensity consistent while working from lower to higher amounts. Your body may be forced to move quickly and recover later if you’re in an act now and think later situation, like that ancestor who got chased by the saber-toothed tiger and lived. Remember to go at your own pace when possible, and challenge yourself to acclimate in intervals. Your body will adjust to its new environment. If you’re completely new to your environment, you could see a big strength gain of up to 25 percent in the first three to six months. When traveling to a new city or culture, you will be fortunate to have access to certain markets and have the ability to ask questions. Though you’ll have to do without favorite foods, the exploration makes the experience even more exciting. It’s more challenging when you’re in the middle of nature, in extreme heat or cold, and there’s no food truck to help you out. Hunting and fishing is now merely a pastime, but tracking your own game and preparing and cooking it once caught are vital in a survival situation. There are tips and tricks that every hunter should know, whether they are a beginner or advanced, such as changing the cadence of your walk to not alert deer. Eat the weeds, literally. What you consider to be a noxious weed in your garden is a secret nutrition ally in nature. Eat paw paws, morels and wild asparagus. Dandelions have high amounts of vitamin A and vitamin C. When cooked down, stinging nettle is a nutritious tea rich in antioxidants and many vitamins and minerals. It also makes a great green in a wild soup or salad. Turn back to nature for herbal solutions when you’re in a pinch. Of course, nature is no substitute for a surgeon when you need one, but such knowledge will aid you for most situations. There are ways that you can treat bone fractures as a survivor with no doctor nearby. Know the difference between an open and closed fracture, and educate yourself on the signs and symptoms of a fracture. Learn how to make a splint for an ankle and foot. A dead tree limb with a fork at one end makes a perfect crutch, and someone of average height needs a crutch to be about 4 feet. While you’re eating the weeds, turn the leftovers into medicines. If you’ve got an ugly gash, use sticky pine sap as wound glue and a barrier against infection. Then, take some white pine needles and get an immunity boost of vitamin C.
There are an abundant number of plants that can save your life in a survival emergency. Barberry, which grows up to 9 feet tall, helps ease bad diarrhea. Catnip, which grows in various types of soil, assists in stopping bleeding when applied topically to the skin. Know your plant allies. Humanity now lives in a modern society, but at any time you could find yourself in a survival situation, whether i’s as a result of a natural disaster, war, or hiking adventure. Perseverance and willpower are a part of adaptation and acclimation to extreme environments. Our ancestors and many modern cultures handle extreme environments today. If you ever find yourself far from home, know that with these tips you will survive and thrive, too.